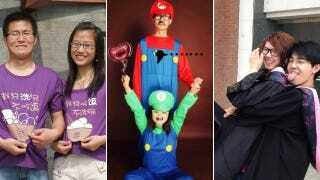 In China, dressing similarly is a bit of a thing between couples, and sometimes even friends. So having a competition between matching couples makes a lot of sense. The competition was organized by Chinese social networking site Douban (via Shanghaiist) as a way to celebrate Winter's arrival. The site regularly hosts contests like these where users are invited to share photos related to a particular topic; really, it's more of a forum to share stuff rather than an actual competition.